In July 2013,Sir John Stuttard assumed the reins of Office of Master and was able to announce two months later that the Court of Aldermen had granted Livery status to the Company on10 September so that it then became the one hundred and ninth Worshipful Company. In anticipation of this significant event, the Company had ensured that its first Sponsoring Alderman became the first Master of the new Livery Company. Sir John had also made the Company a beneficiary of his Lord Mayor’s Appeal in 2006/7 and thus ensured that it could meet the necessary financial targets required by the City of London for such advancement. 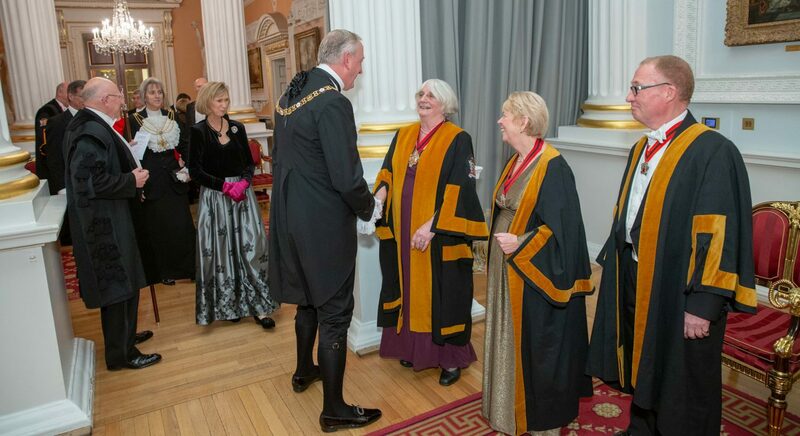 The Grant was celebrated at a memorable banquet at Mansion House in February 2014. Immediately prior to this banquet, at a special Court of Aldermen, the Lord Mayor presented the Company with its Letters Patent and, at the banquet, William Hunt, Windsor Herald, presented the new coat of arms of which the design and production had been overseen by Past Master Professor Raymond Clark OBE. At the Celebration Banquet, the Pikemen and Musketeers of The Honourable Artillery Company were in attendance as was the HAC Band. The Egyptian Hall was full to capacity with 350 members and guests attending. The Company was presented with a new oak lectern, designed by Ben Lamb, from the Buildings Crafts College, and donated by Renter Warden, Liveryman Mrs Ann Bell and Liveryman Stanley Cornford. The Annual Mary Lou Carrington Award was presented by Lord Carrington to Josephine Connell, OBE. The guest of honour and guest speaker was the Vice Chancellor of Cambridge University, Professor Sir Leszek Borysiewicz. During the year, the Company was pleased to welcome many guests and, in particular, the guest speakers at its formal dinners: Sir David Wallace, CBE, Master of Churchill College Cambridge; the Very Reverend Dr David Ison, Dean of St Paul’s, who preached at our Annual Service; Sir John Armitt, CBE, Chairman of City & Guilds, who gave the Franklin Lecture; and Edward Smith, CBE, Pro-Chancellor and Chairman, University of Birmingham. An experiment, which proved to be successful, was the combining of the Election Court Dinner with the presentation of awards by the Educators’ Charitable Trust, hosted by Martyn Lewis, CBE, the broadcaster who had compered the Dragon Awards at the Mansion House for many years. The guest speaker on that occasion was Sir Michael Wilshaw, Head of Ofsted. Discussions were concluded with the Worshipful Company of Vintners so that the Company could move there for its dinners at the end of the contract with Painters’ Hall. The first Court meeting and dinner at Vintners Hall was held in April 2014. The Company membership continued to grow and the number of members at 31 March 2014 had increased to 264 compared to 240 at 31 March 2013. Of these, 150 had transferred to livery status. At the July Annual Assembly the total membership had increased further to 279. Furthermore, at the beginning of the new accounting year, the General Reserves were almost £74,000, which gave a sound base for the increased expenditure which the Company anticipated incurring with its new status. In the last few months of Sir John’s Mastership, he reached the end of his second six year term as an Alderman and, being close to the retirement age for City Aldermen, he stood down from the Court of Aldermen. In stepping down he arranged for Alderman Sir Paul Judge, a long-standing member of the Company, to take his place as Sponsoring Alderman for the last few weeks before the Company no longer needed one as it was translated to full Livery status. Sir Paul was also elected to serve as the Aldermanic Sheriff of the City for 2013/14, and he was to be followed in the subsequent year by Honorary Liveryman, Alderman Andrew Parmley elected as a Sheriff for 2014/15. Furthermore Liveryman Peter Estlin was elected as an Alderman at the end of 2013 – a significant record of civic service for a nascent livery company ! An active programme of seminars continued at Gresham College based on this year’s themes of vocational education and careers advice, under the competent supervision of Liverymen Elisabeth Goodwin and Geoffrey Edwards. This programme provided the flagship contribution to taking the debate on educational issues forward involving in its activities those outside the Company membership, as invitations went to many educational organisations and to the other livery companies – and their attendance was good. The Company was particularly grateful to The Commercial Education Trust (CET), a charity founded by the London Chamber of Commerce and Industry, for its substantial help in sponsoring the seminar programme which also enabled all the seminars to be videoed so that they were available on the internet. One of the highlights of the year was the annual Public Speaking Competition, organized by Liveryman Mrs Pamela Taylor, also held at Gresham College, involving pupils from schools in the London area, and. the competition was based on each speaker presenting a topic of their choosing for four minutes followed by questions from the floor. The subjects were varied and interesting and the standard was high, topped by Georgia Greaves of James Allen’s Girls’ School in East Dulwich. Another was the lively social programme arranged by Liveryman Mrs Ann Bell including social events at Kop Hill (a hill climb in Buckinghamshire, with vintage Rolls-Royces and other veteran, vintage and classic cars); the Royal Opera House; Bletchley Park; a “Master’s Weekend” in Cambridge (with visits to the Churchill Archives Centre and the Parker Library at Corpus Christi College, where the participants dined in Hall); and then a visit to Capel Manor, the Horticultural and Arboricultural Training College near Enfield. The Honorary Foundation Clerk, Keith Lawrey, revised the Company’s Handbook, containing the Ordinances and Regulations, following the Grant of the Letters Patent. This was printed and made available but, in future, it is likely that the Ordinances and Regulations will be published in e-format and included on the Company’s website. After 17 years of voluntary service to the Company, Mr Lawrey announced his intention of stepping down as Clerk during the year 2014/15. As a result, a working party was established to review the future administration of the Company including prospective accounting arrangements and support, the location of the Clerk’s Office, a job specification for a paid Clerk and the process for the recruitment of the new Clerk. Following recommendations in this report, the Court agreed that a five year lease would be taken, together with the Masons Company, on office premises in Little Trinity Lane so that the Company would have a “City office”. Past Master Dr Nicholas Carey, who had served as our Honorary Treasurer for many years and who helped prepare the financial and other documentation in connection with the application for the Grant of Livery status, retired at the end of the financial year to be succeeded by Past Master Raymond Clark, OBE.